Heat oil in a wok and when it gets very hot, add the ginger and garlic. Once the ginger and garlic are fried, add the sprint onions and cabbage. Saute on high heet for a min and then add the carrot and beans. Once the veggies are cooked slightly (don't let them overcook), add the noodles, salt, pepper, chilli flakes, msg, vinegar, soy sauce and mix well. 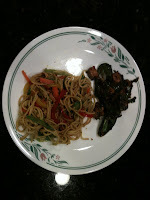 Let the noodles cook on high heat for a couple of mins and they are done. Heat oil in a wok and when really hot, add the ginger and garlic. Let it cook for a couple of mins. Add the spring onions and paneer and stir fry until the paneer browns lightly and starts turning crisp. Add the jalapenos and cook for a couple of mins. Add the mushroom soy sauce and cook for 2 mins. Add more soy sauce if you want a little sauce in the dish. Garnish with some sprint onion and enjoy hot. Roast the poppy seeds, jeera, dhania, red chillies, cinnamon, cloves and cardamom separately and grind together with the ginger, garlic, turmeric, grated coconut and salt to make a fine paste. Heat oil and saute onions in it till golden brown. Add the paste and the tomato puree and cook till you see a uniform consistency and some oil separated on the sides. Add the yogurt and mix into the gravy. 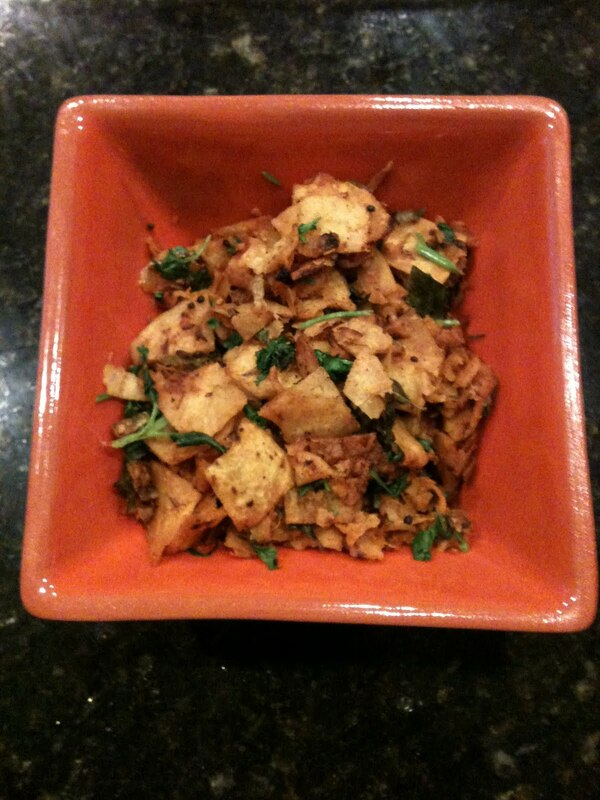 Add the potatoes and kasuri methi and a enough water to cover the potatoes. Place a lid and steam till the gravy and potatoes are fully cooked. I never really thought about blogging this recipe until last week. As I was making this with my sister in her kitchen and walking her through it, I realized that not everything involved in it is intuitive and simple and its worth a blog post. 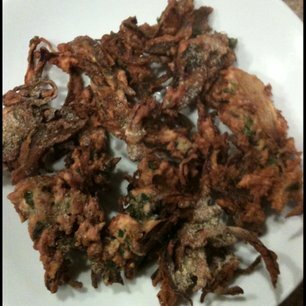 This recipe evolved over the last 3 years and prior to that I used to make simple soggy onion pakoda. 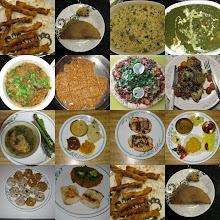 Some of it was inspired by this post by Asha of Foodie's hope and others are techniques I learned over time. Mix all the ingredients above without any water. 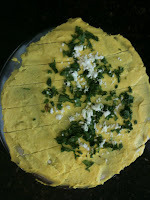 Add more besan or rice flour if needed. The end result should be onions that are mildly moist and coated slightly with the flours. You should see more onions than flour.Do not add water unless the mixture is too dry. Take 1 tsp of the heated oil and add it to the mixture. This and the less water help make the pakodas very crispy. Heat oil in the pan and use two forks to drop the onions and separate them in the pan. Try not to drop lumps but each onion piece separately. This makes a huge difference. Fry until golden brown and sprinkle with chat masala as soon as the pakoda is out of the oil and serve hot with tomato ketchup. I wanted to recreate the vegetable kurma they serve in south indian restaurants with puri or parotta forever! I finally got to it last weekend after scouting the internet for recipes and here is the outcome. Some recipes called for cauliflower also but I stuck to the usual suspects of potato, carrot, beans and peas since that is all I had in my fridge. 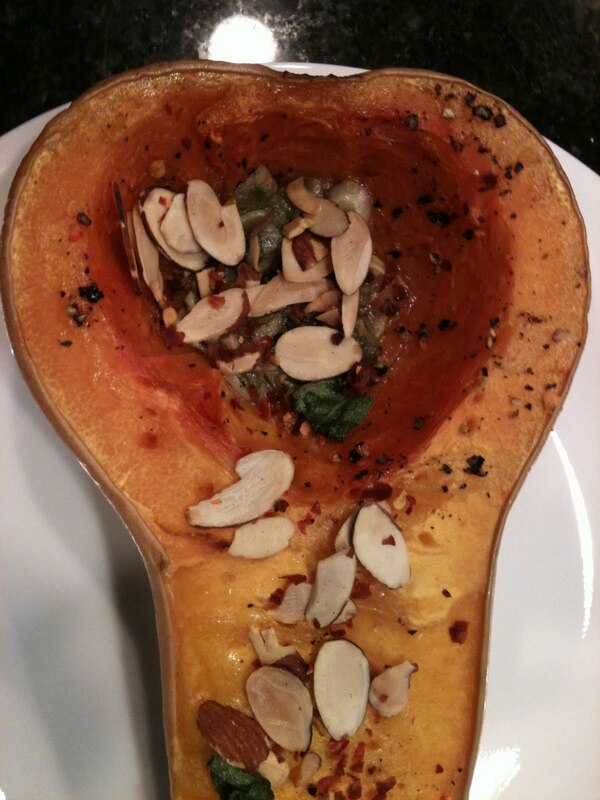 This is a great dish if you want to get rid of your aging staples. Roast ingredients 1 through 5 and grind together with ingredients from 6 to 10 to make a fine paste. Heat oil in a pan and add the bay leaf to it. Once you smell the aroma of the bay leaf, add the onion and saute till golden brown. Add the paste and saute till the rawness in the spices is gone. Add the potato, peas, carrot, beans, salt and enough water to cover all the veggies and cook on medium heat until the water reduces to form a gravy and the veggies are thoroughly cooked. Add the milk or cream and cook some more. 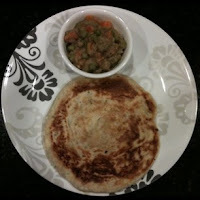 Serve hot with puri or parotta. This kurma tastes better as it ages. Yesterday was Ram Navami and I made the usual fare of panagam and neer more. I have posted the recipes for these previously here. 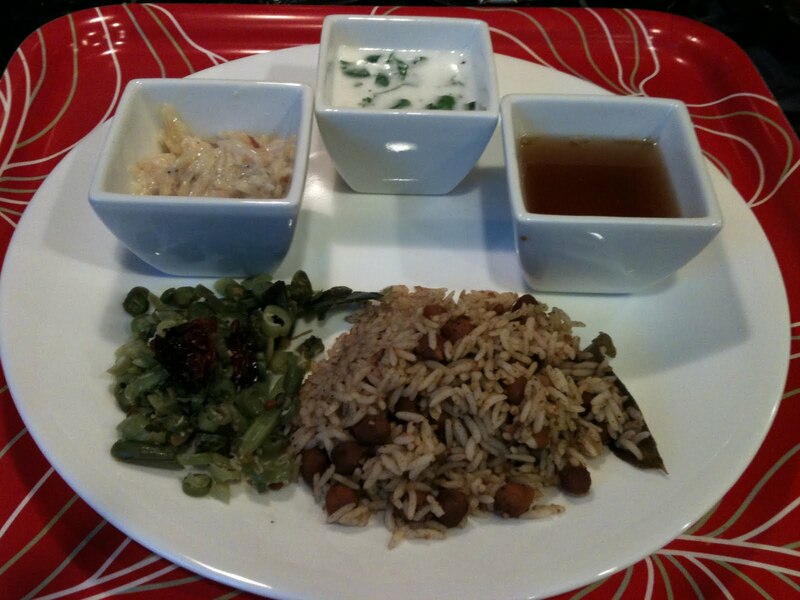 I also changed it up by making semiya payasam (kheer), puliyogare with homemade pulikachal and beans curry. 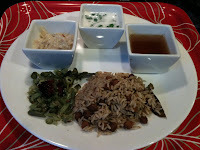 Tamarind rice is a very interesting dish to me and I have spent extensive time researching the nuances in the different versions. My love for it started from the tamarind rice given as prasadam in the temples in Hyd and during Ganesh Chaturti. It took me many years to replicate this version in my kitchen. It is called Pulihora in Andhra. This version is based purely on the flavor of tamarind and its sourness with some auxiliary things like chana dal giving added flavor. This tastes best a few hours after it has been made because rice then has enough time to soak in the tamarind's sourness. Puliyogare which is probably the kannada version uses some added spices which give it a darker color and enhances the flavor even more. I have not yet made this on my own. I use MTR's Puliyogare powder or paste and it turns our fine. This is a quick fix for a busy weekday night or when you have leftover rice. 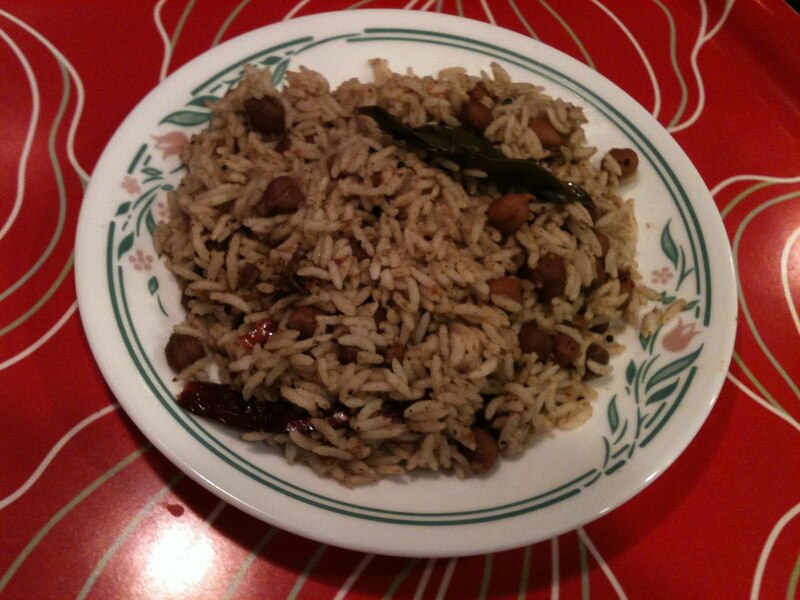 Pulikachal, which is the tamilian version, is mixed into rice to make Puli Chadam. What you see in the picture above is this. Pulikachal ends up being a thick tamarind pulp, reduces over a medium flame, with a spice powder added to it. 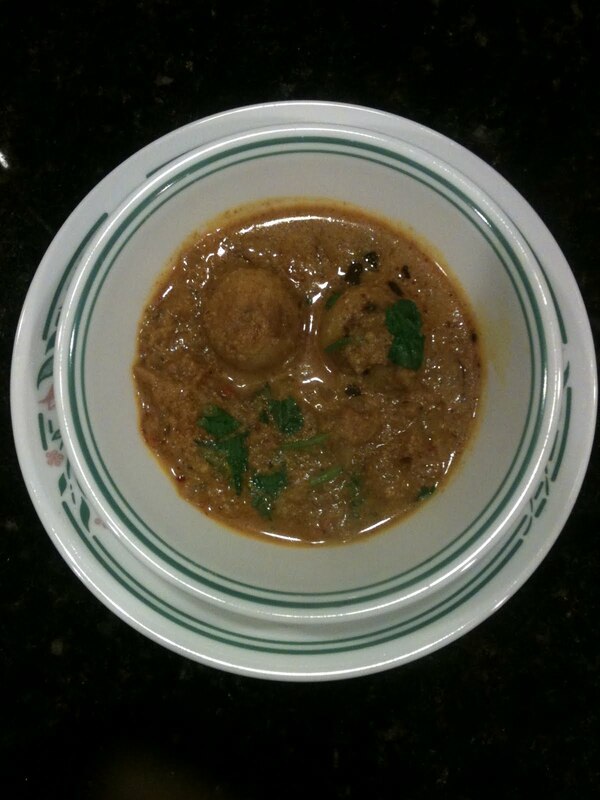 My MIL's version also has kabuli chana which I usually add but for a change I added black chana. This definitely ups the protein content of the dish and give you something interesting to chew besides rice in this dish:). To help make the cooking process quick, I usually make the spice powder in bulk and freeze. Pulihora Recipe: The beauty of this recipe is in its simplicity. You can add soaked and boiled black chana to this as well. Add anything more and you lose the authentic taste. I reached this conclusion after many trial and error recipes. 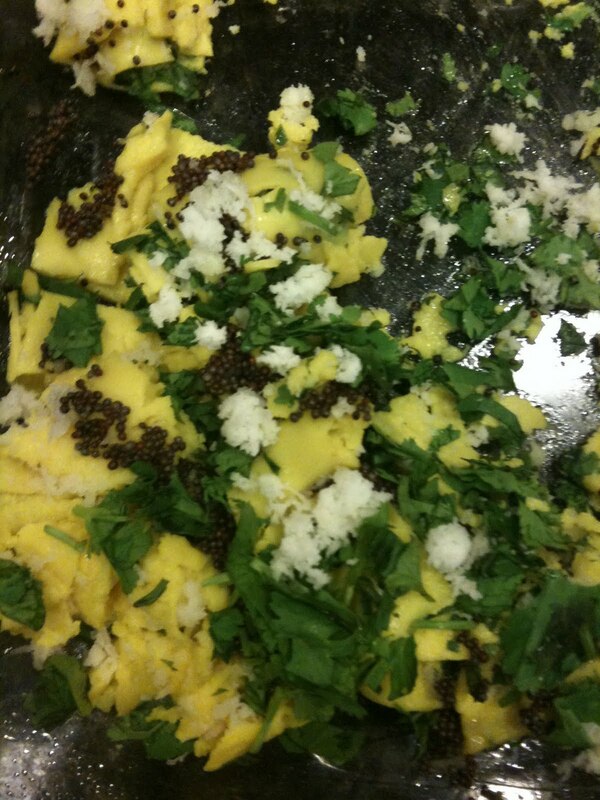 Heat oil in a pan and add mustard seeds and turmeric to it. Once the mustard seeds have sputtered, add urad dal, chana dal, peanuts, green chillies, red chillies, curry leaves and roast these until urad dal and chana dal is golden brown. You may want to roast the peanuts separately and then add as they take longer. Add the rice, tamarind pulp and salt and mix well. Taste to check the sourness and add more tamarind pulp if needed. Place a lid and let the rice steam so that the rawness of tamarind goes away. 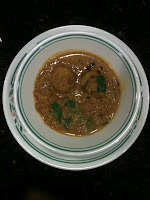 Puliyogare Recipe: I dont really have an authentic recipe for this one. My friend promised me one and hasn't given it to me yet (you know who you are :) ). I promise to blog once I have it. I use the MTR puliyogare powder. I make tadka with mustard, peanuts, red chillies and add the mix followed by rice. Pulikachal Recipe: This recipe is split into 3 parts - recipe for the spice powder, recipe for the pulikachal and directions to make puli chadam. Pulikachal spice powder recipe: This is an adaptation from my MIL's recipe with some changes. Directions: Roast all the above ingredients individually in the oil and grind together to form a powder. The coconut should be roasted until it is golden brown. This can be made in bulk using cups for measurement instead of tsps as long as you keep the proportions. Pulikachal Recipe: Pulikachal can used as a pickle or as a quick mix with rice to make puli chadam. 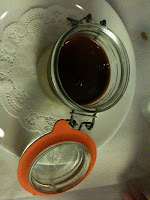 It can be stored in an airtight jar in the fridge for a couple of weeks. Heat oil in a pan and add mustard seeds, turmeric and hing. Once they sputter, add urad dal and roast till golden brown. Add red chillies and curry leaves and roast till you can smell their aroma. Add the black chana or kabuli chana and roast well for about 15 mins. Add the tamarind pulp, water and salt and boil this mixture until it reduces and becomes a thick pulp. This usually takes 30-45mins. Add the spice powder and mix well. Pulikachal is ready. I made a lot of dishes for this Gudi Padwa but the star of the day was Shrikhand which is the ambrosia of Maharashtrians. 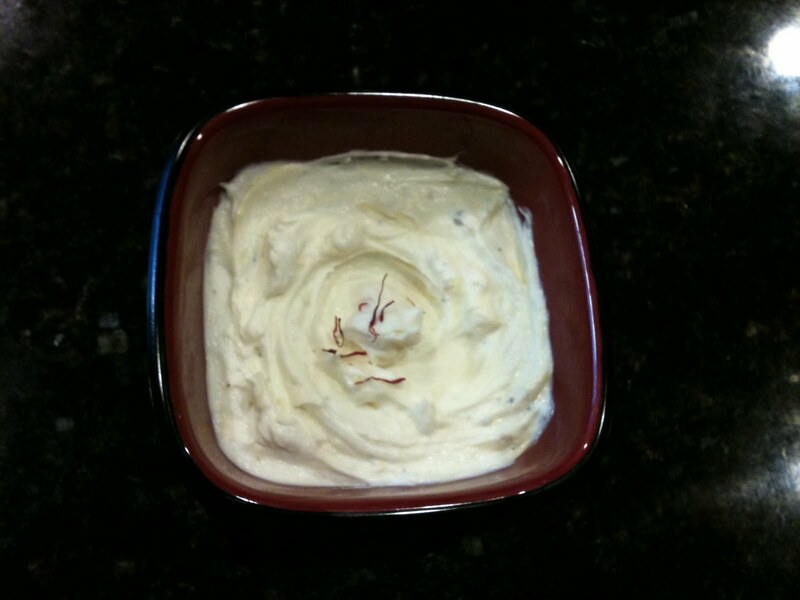 Its a creamy dessert made from yogurt and flavored with cardamom and saffron. If you want to make a fat free light version of this, I'll tell you right away that it is simply not worth it. The delight of this dish lies in its creamy richness and you just cannot do away with using full fat yogurt. It is best enjoyed when you let it sit for at least half a day so that the flavors get absorbed and be sure to chill it before devouring it with hot puris. My dad is a connoisseur of Shrikhand and I got specific instructions( more like questions) from him when I was making this dish. His expression and happiness when he eats this dish always reminds me of a cat that eats the cream and purrs with pleasure and has cream dangling from its whiskers:D:D This post and dish is dedicated to my gourmand dad from whom I inherited my enthusiasm for food and thereby honed my talent in the kitchen. Sugar - I used about 1 cup but it could vary based on how sweet you like it. 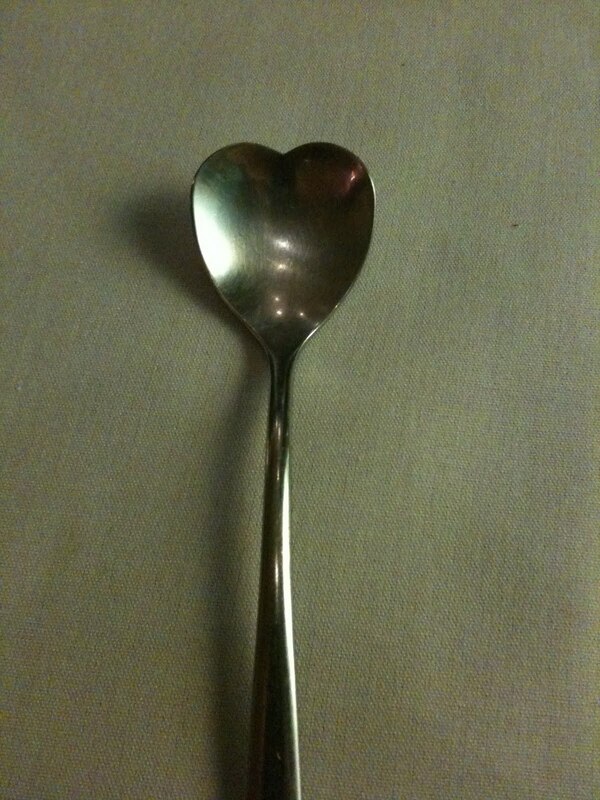 I suggest adding 1 spoon at a time and doing a taste test until it feels just right. Drain the water from the yogurt by tying it in a thin cloth or cheese cloth and hanging it a little above the ground so that gravity can aid with this. I usually hang it on my tap and suspend it in my sink. You may have to do this overnight for the liquid to be completely drained out. What you are left with is a thick creamy residue. If you feel that this is grainy, you can send it through a sieve but I find that for the yogurt in USA you don't need to do this. Add sugar, cardamom powder and saffron and mix really well into this yogurt. Do this a day before serving for better results. It always tastes yummier the next day. Thats pretty much it. 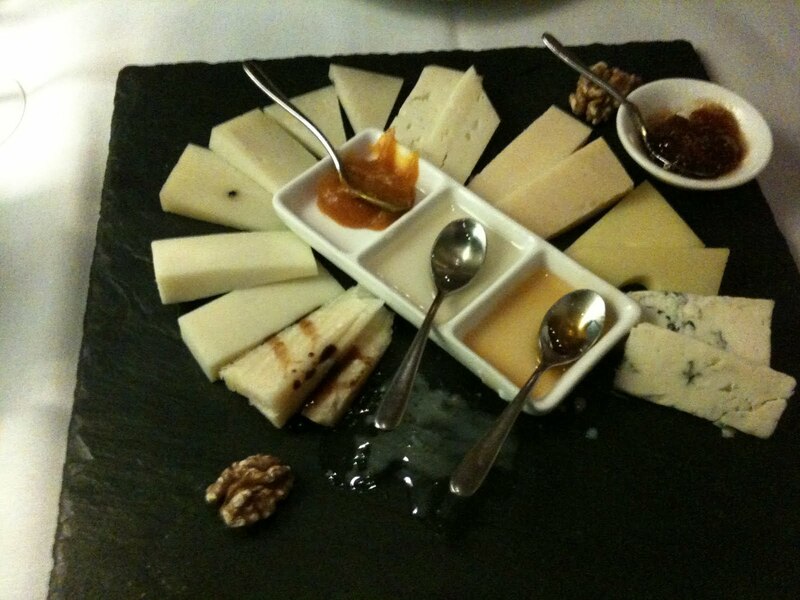 You can add some dried fruits to this if you like but it tastes heavenly as is. Another variation of this called 'Amrakhand' is made by adding mango pulp to the shrikhand. You can make it the same way as above with lesser sugar since you have the mango pulp for sweetness. 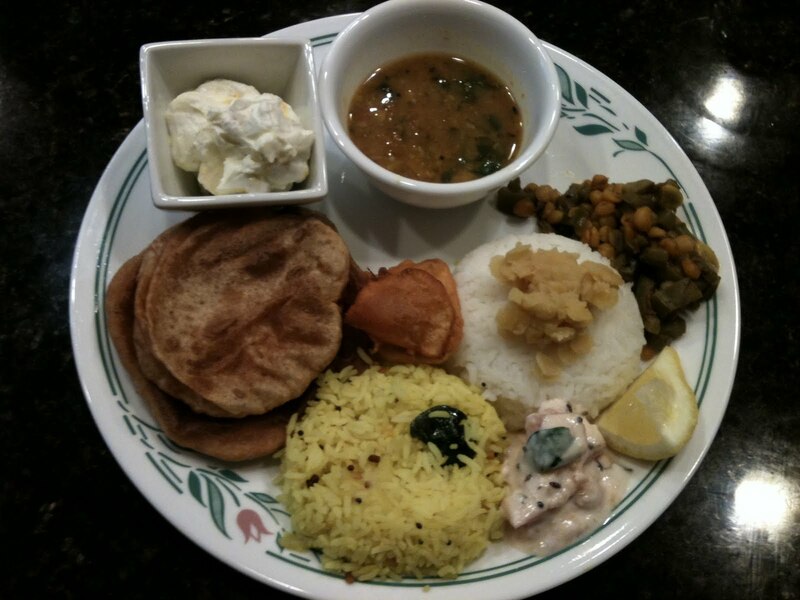 Koshimbir: The name of this dish applies to all raita-like dishes made with tomato, cucumber, carrot, onion or a combination of them and even guava. What distinguishes the maharashtrian way of making this is the distinct flavor of peanut powder in it. Mix the tomatoes, rogurt, salt, sugar and peanut powder together. Heat oil and add the mustard, jeera, hing, green chillies and curry leaves to it. Once the mustard seeds sputter, add it to the tomato mixture and mix well. The same can be done with cucumbers and grated carrot instead of tomatoes. Add the dal and cut ridge gourd pieces, salt, kala masala, red chilli powder, jaggery and water and once mixed, place a lid on the pan and let it all steam until the water reduces a little and the veggies are cooked. I am in love with Trader Joe's 99% fat free whole wheat sourdough bread. Its been a staple in my kitchen for the last month. It tastes yummy and toasts really well. It makes an interesting base for sandwiches and tastes even better for breakfast with butter and orange marmalade. 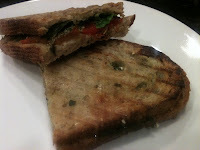 I whipped up this quick sandwich on a weekday when I had all the ingredients at hand and felt like eating a panini. It was a very tasty and quick dinner. Take two slices of sourdough bread. Layer one with the goat cheese and other with the pesto. Layer the sun dried tomatoes, roasted bell pepper and basil leaves. Sprinkle salt and pepper as needed and sandwich the two slices of bread. Brush on both external sides with olive oil and grill in a panini press. Cut the sandwich into two halves if it is too big and enjoy with soup or a salad. Heat oil and add mustard, jeera and turmeric. Once the mustard seed sputter, add the green chillies and curry leaves. Add the chappati, chilli powder and salt and cook till well done and the chappati start becoming a little crisp. Add the coriander and lemon juice and mix well. Take the pan off the gas. Heat oil in the pan and add mustard, jeera, turmeric and hing. Once the mustard seed sputter, add the green chillies. After a min, add the onions until they are not totally cooked and slightly underdone. Add capsicum and saute for 2 mins. Add the rice, chilli powder and salt. Mix well and let the rice steam and get cooked thoroughly for a few mins. Add the corriander and lemon juice and the dish is ready. Note: When cooking with stale food, it is always important to make sure the dish is heated and cooked well. Smother the butternut squash with 1 tbsp melted butter, salt, pepper and stick it in the over at 350 F. I had to bake it for almost 45 mins to get it soft but the bake time might vary depending on the oven. Use a fork to check the done-ness frequently after 30 mins have elapsed. Toast the slivered almonds either in a pan or an oven until golden brown. Take 1/4 tbsp of butter and sautee the chopped sage leave for 5 mins. 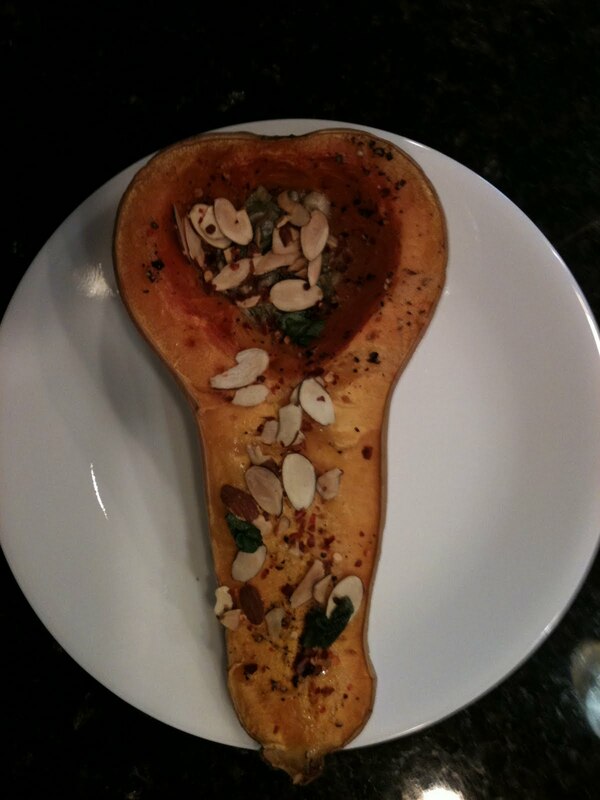 Top the bakes butternut squash with chilli flakes, toasted slivered almonds, sage leaves and the remaining butter while its still hot and enjoy. Note: You may use parsley to flavor instead of sage if you are averse to its smell. We re-did another dining experience by celebrating Valentine's day at Tigelleria which we discovered on our anniversary 2 years ago. We ordered a pear stuffed ravioli with walnut sauce, a cheese platter, a very pretentious salad and pesto fusili pasta. 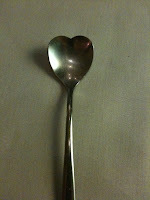 The dessert was pistaschio pannacotta which was served with a heart shaped spoon. A very satisfactory meal indeed!